This post covers some of the things I’ve been reflecting on after giving my first presentation since starting the PhD and after I attended a conference earlier this month. I volunteered to present because I wanted to do something that would challenge me, take me completely out of my comfort zone and force me to face my fear of public speaking. Like a lot of people, I feel fairly confident chatting about my subject around the table with peers, but when it comes to standing up at the front of a room and being stared at, expected to be knowledgeable and interesting and personable (all at the same time), my legs turn to jelly. But I did it, and like always it wasn’t quite as bad as I thought it was going to be. My nerves about presenting made me think about a paper given by Sara Mills and Katie Edwards on International Women’s Day this year about gender and performance anxiety. They observed that women are often viewed as ‘lacking in confidence’ when it comes to public speaking- I know I’ve attended various workshops on ‘how to build your confidence’ over the years. Yet, as Mills argues, what if we considered female performance anxiety from a different standpoint- not as a personal deficit in an individual, but simply as a gendered response to a wider social situation? Public speaking has traditionally been the preserve of men, and many of the traits associated with a talented public speaker- assertiveness, control and authority- are also associated with masculinity (for more on this see Mills, 2012). Thinking about the way in which I felt before presenting at the Research Café, I realised that my main concerns were that I wouldn’t convincingly ‘perform’ this role as an academic presenter, and that I would be ‘found out’- that the audience would uncover all the things that I still don’t know and ask me difficult questions that I wouldn’t be able to answer. Presenting your work and going to conferences are meant to be some of the more fun parts of academia. Much as I look forward to attending an interesting-sounding conference, part of me is always dreading it, particularly if I don’t know anyone else who is going. There’s a certain level of expectation at conferences- that you’ll have witty and interesting questions to ask, that you’ll find it easy to get chatting to others over the buffet table, and that you’ll understand all the various references to people and research that are casually thrown around. I still can’t help feeling a bit stupid, though. There are so many people and things referenced that I don’t know. I (still) haven’t got a clue about what Weber thinks about teaching. I think I still feel like a bit of an imposter at these things. The imposter phenomenon has been well documented by researchers in psychology (Langford and Clance, 1993; Sakulku and Alexander, 2011). Interestingly, the feeling of fraudulence and the resulting fear of being ‘found out’ has also been observed to be found more often, and with greater intensity, in women than in men (Clance and Imes, 1978). Seeing the cartoon below posted by colleagues on Twitter made me realise how many people in academia feel this way. 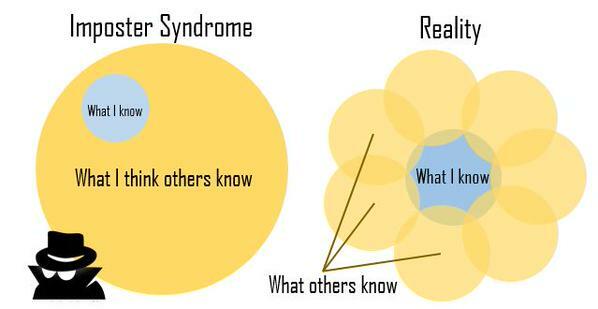 It seems to sum up how I feel, but also acts as a perspective check- the reality is that no-one can know everything, and just because I don’t know as much as others doesn’t mean that I don’t have a right to be here, or that I’m not good enough. Reflecting on these issues of confidence, it seems to me that it’s something which is incredibly dependent on circumstance and context. Of course, there are individuals who will be comfortable in any kind of social or professional situation, who wouldn’t be phased by public speaking in any arena, or by that other expectation implicit in academia- networking. Yet there are others for whom public speaking wouldn’t be difficult, but who do not relish the idea of networking because it requires a degree of gregariousness which not everyone has. 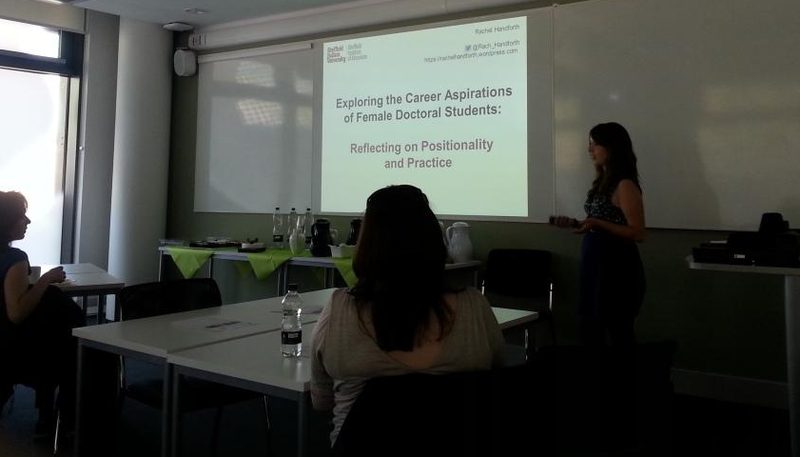 One of the things that really resonated with me from the conference was when an early career academic talked about the difficulty she found in being expected to ‘network’ at conferences. She observed that the traditional view of networking requires you to be outgoing, and admitted that she found this challenging because she was naturally introverted, and would rather e-mail someone she wanted to have a conversation with after the conference instead. It was so refreshing to hear that, and a bit of a relief too. However, it made me consider how academia and one of the main ways in which it is ‘performed’- through conferences which necessitate the delivery of presentations and the networking which is directly involved (not to mention the logistical aspects of travel and time away from caring responsibilities)- is not structured in a way which makes it possible for everyone to engage equally.